Description: NASA test pilot Don Mallick, in full pressure suit, stands in front of the YF-12A (60-6935). Don is ready for a flight across the Western United States. Donald L. Mallick joined the National Advisory Committee for Aeronautics’ Langley Aeronautical Laboratory at Hampton, Virginia, as a research pilot, in June 1957. He transferred to the National Aeronautics and Space Administration’s Flight Research Center, Edwards, California, in February 1963. Mallick attended Pennsylvania State University, University Park, Pennsylvania, for the period 1948-1949, studying Mechanical Engineering before entering the U.S. Navy for pilot training. Don served during the Korean War period, 1950-1954, flying F2H-2 Banshee jets from the carriers, USS F.D. Roosevelt and the USS Wasp. Later in 1954 he returned to school at the University of Florida, Gainesville, Florida, graduating with Honors in June 1957 and earning his degree in aeronautical engineering. Don joined the Naval Reserves and served in almost all categories of Reserve operations before retiring in 1970 as a Lieutenant Commander. As a research pilot at NACA-NASA Langley Don flew quantitative stability-&-control and handling-qualities tests on modified helicopters. On the Vertol VZ-2 Vertical Short Take-off and Landing research aircraft, he performed qualitative evaluation flights. Other aircraft flown for flight tests were: F2H-1 Banshee, F-86D, F9F-2 and F8U-3, F11F-1 Tigercat, and F-100C. Don also flew support and photo flights. In his capacity as research pilot at the NASA Flight Research Center Don was assigned to NASA's Lockheed Jetstar General Purpose Airborne Simulator (GPAS). He flew all of the tests, with the majority being as project pilot. Mallick made a flight in the lightweight M2-F1 lifting body on January 30, 1964. In 1964, Don was assigned to and completed the USAF test pilot school, Class 64A. Later in 1964, he flew as the co-project pilot on the Lunar Landing Research Vehicle (LLRV) making over seventy flights including the first using the three-axis side controller. In 1967, he was assigned to fly as one of two NASA pilots on the joint NASA-USAF XB-70 flight test program. 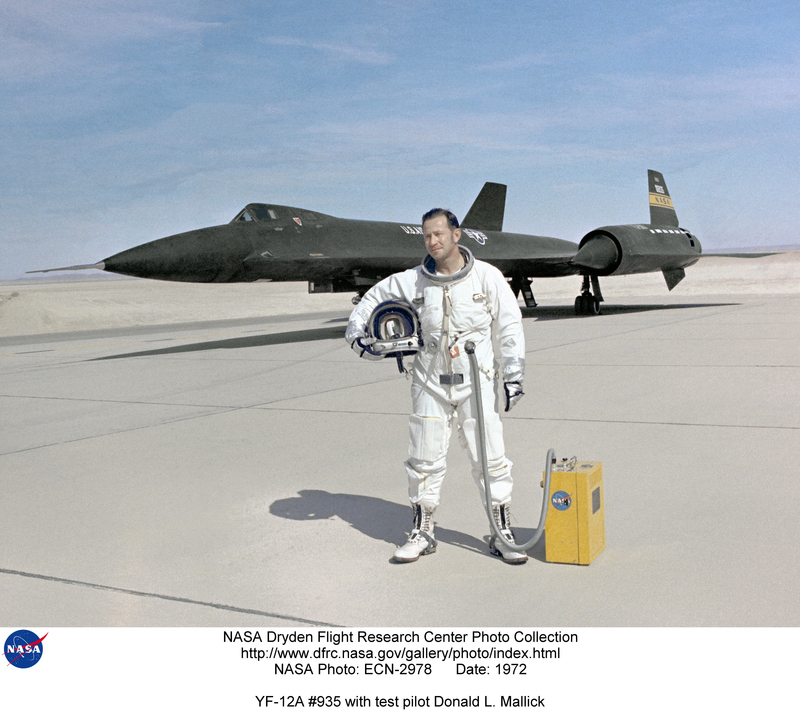 Don flew as one of two NASA test pilots on the NASA YF-12A and YF-12C test programs accumulating 215 hours in 105 flights of test time in the triple-sonic Blackbirds. He was project pilot on both programs. Mallick was appointed Chief Pilot of the Flight Research Center in 1967, a position that he held for fourteen years. He was proud of the fact that during this period he flew himself and also directed six other NASA test pilots without a fatal accident. In 1981, he became Deputy Chief of the Aircraft Operations Division. Don retired April 3, 1987, after logging over 11,000 flight hours in more than 125 different types of aircraft and helicopters. Mallick has written several reports. In 1975, he was selected and honored as a Fellow in the Society of Experimental Test Pilots, of which he is still a member.